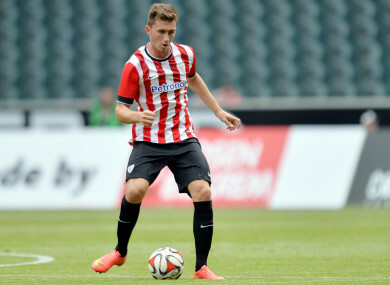 Aymeric Laporte made over 100 appearances for Athletic Bilbao. MANCHESTER CITY COMPLETED a club record deal for Athletic Bilbao defender Aymeric Laporte on Tuesday in a move by Pep Guardiola to bolster the Premier League leaders’ defence for the title run-in. The 23-year-old Frenchman is Guardiola’s sixth signing of the 2017/18 season and has joined in a deal until 2023. “I am very happy to be here,” Laporte said. “City are a club with a lot of ambition and they are one of the best teams in Europe. Txiki Begiristain, City’s director of football, said: “We are delighted to have signed Aymeric. We have assessed defensive options and he is a player we have admired for a long time. Email “Man City confirm signing of €65 million French defender ”. Feedback on “Man City confirm signing of €65 million French defender ”.